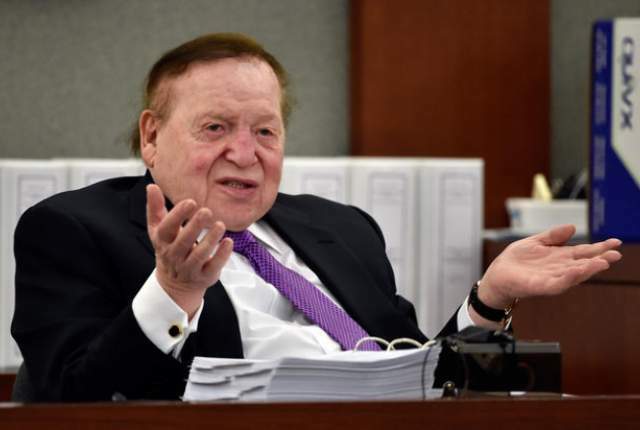 Sheldon Adelson, chairman and CEO of the Las Vegas Sands Corp. Photo by the Las Vegas Review-Journal. The stealth purchase of the Las Vegas Review-Journal by casino magnate Sheldon Adelson had journalists guessing for a week about the identity of the new owner and had some fuming over a lack of transparency, a prime tenet in media ethics these days. But why should we be surprised by all this? Very rich men often play by their own rules and get away with it. Even in media, top executives sometimes believe they are exempt from the ethics standards they hand down to their employees. Journalists are warned against forming close personal ties with the sources they cover in case of conflicts of interest or an appearance of conflict. Publishers, however, party and play golf with the high and mighty covered by their staffs and call that good business. They see themselves as business men and women, not journalists. In this case, we’re talking about a businessman in the Las Vegas casino business, where razzle-dazzle is the way the game is played. The house always wins. Politics makes it more complicated. Adelson reportedly declined mentioning his purchase of the largest Nevada newspaper, even denying it as first, because he did not want it to distract from the fifth GOP presidential debate being held at the time in the Venetian resort hotel casino owned and operated by the Las Vegas Sands Corp., of which Adelson is chairman and CEO. Clearly, politics took priority. And that might offer a clue into some of the leading questions in Las Vegas these days, such as what does Adelson want, and what does he intend to do with the newspaper? Billionaire Adelson and his wife are major Republican party donors. And they are strong advocates for Israel. They have a history of aggressively pursuing their interests. And politically, Nevada is a swing state. After he was outed, first by Fortune magazine, as the newspaper’s new owner, management issued a message saying it intends to publish a newspaper that is fair, unbiased and accurate, and to hire a reader advocate or ombudsperson. The statement said nothing about transparency. The newspaper itself reported that an unidentified buyer paid $140 million on Dec. 10 for the Review-Journal and sister publications, raising a lot of questions, including “Who now owns Nevada’s largest newspaper?” Journalists argued they have a right to know who they work for. The same day, the Review-Journal published an in-depth report on how Adelson’s son-in-law arranged the sale. “What Will Sheldon Adelson Do With The Las Vegas Review-Journal?” headlined Forbes. “This is a big moment for American journalism and politics,” it said, suggesting it could prove Adelson heavy-handed in the exercise of personal power, or not. Forbes lists Adelson 15th on its Forbes 400 list of billionaires, with a net worth of $24.5 billion. The New York Times headline: “Sheldon Adelson’s Purchase of Las Vegas Paper Seen as a Power Play.” This is where the Adelson story gets complicated and “ominous,” as the Times tells it. Even before Adelson was revealed as the new owner, Review-Journal reporters were dispatched over their protests to monitor or observe the actions of three local judges, including one, Clark County District Judge Elizabeth Gonzalez, who is hearing a case against Adelson and his gaming company. The case involves allegations of bribes and possible ties with organized crime. Nevada law bars casino owners from associating with members of organized crime. The case “could have significant repercussions for Mr. Adelson’s future in the gambling industry, and his high-priced legal team has fought it vigorously,” said the Times, including attempts to remove Gonzalez from the case. Adelson, 82, “rose to prominence in the city as the combative, litigious owner of the Sands Casino, and a political kingmaker,” said the Times. Adelson has said his most important issue in supporting candidates in U.S. elections is “the safety of Israel.” He believes Republicans are more supportive of Israel than Democrats, and that Republicans are more charitable than Democrats. He is rumored to have spent more than $100 million trying to defeat President Obama in 2012. The billionaire has not yet thrown great financial support to a presidential candidate. At the Dec. 15 GOP presidential debate in Las Vegas, Adelson reportedly met privately with Donald Trump. At that debate, said the Washington Post, Adelson told CNN that he had “no personal interest” in the Review-Journal, before he was revealed at its new owner. Until now, Adelson’s relationship with media has largely been through litigation. He sued London’s Daily Mail and the Wall Street Journal for defamation, and sued Las Vegas publications for comments about him. One of those suits bankrupted a Review-Journal columnist who wrote a book about casino moguls. Former business associates also have sued Adelson. Now Adelson joins the ranks of billionaires who own American newspapers. Amazon.com founder Jeff Bezos owns the Washington Post. Berkshire Hathaway CEO Warren Buffett owns a string of local publications. Investment manager John W. Henry owns the Boston Globe. As if the Adelson story is not strange enough, it took a twist to the twilight zone when he told Reuters that the Las Vegas Review-Journal might learn something from a free tabloid he started in Israel in 2007, Israel Hayom. It’s Israel’s largest paper by circulation. Adelson “may take some of the positive characteristics of our Israeli newspaper and add them to there,” he told Reuters. Casey Bukro is a former Chicago Tribune reporter and editor. If you have any questions about journalism ethics, call 866-DILEMMA or contact ethicsadvicelineforjournalists.org.